Robert Blair is a “two time loser” when it comes to 100 mile races. He entered AC100, which was cancelled by the largest fire in L.A. history, and the Chimera 100, which was ultimately cancelled after 7-8 hours due to severe and unsafe weather. Here’s the Southern Californian’s report about Chimera, which was his first 100 mile start. 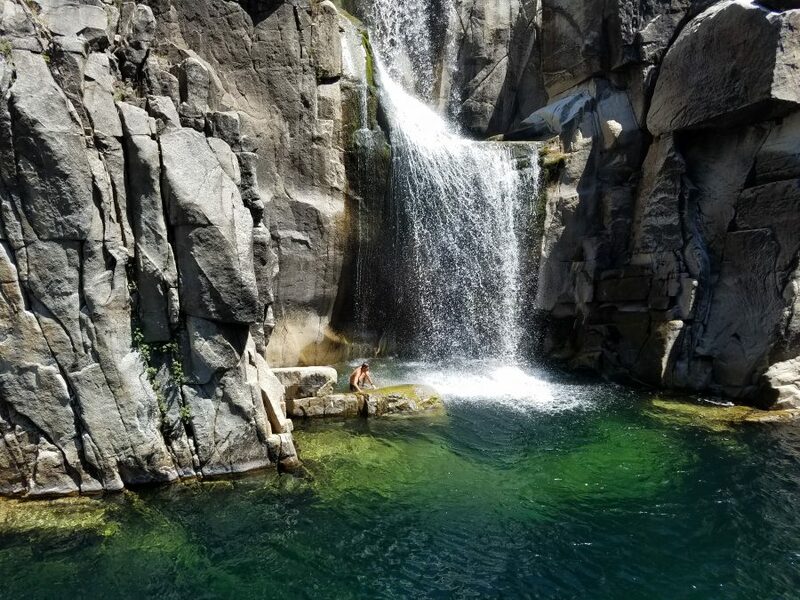 Ever wonder, like I did, why there are not more 100 mile ultra marathons scheduled, even in a “warm” state like California, in the month of December? Wonder no further. Just look to the running of the 2009 Chimera 100K and 100 mile races, which started and ended (for everyone) this past Saturday, December 12th at Bluejay campground in the Cleveland National Forest, between San Juan Capistrano and Lake Elsinore, CA. This year, unfortunately, the Chimera was neither the ultra runner nor the mountain, but the weather. After the runners were out for about 7 hours, the Forest Service and Race Director, in conjunction, cancelled the race due to the worsening weather conditions on the course. Runners had experienced extreme wind, cold and rain on certain sections, and an even stronger and colder storm was predicted for the late afternoon and evening, with snow levels dropping to 5,000 feet (500-700 feet below two of the peaks that 100 mile runners would have to run up to three more times during the afternoon, night and/or following morning). However disappointing, it was the right call to make. Some runners, who had made it past the 28.5 mile Maple Springs aid station before the race was called, were able to run all the way to the Silverado aid station at approximately mile 38.2. What I enjoyed and appreciated most about this year’s race, besides my excellent crew of Cheryl Zwarkowski, and Jose Hernandez (who would have been my pacer had I gotten to mile 62) were the absolutely kind and giving volunteers at the start/finish, and all the aid stations we arrived at in between, and the stretches of the race I ran with other runners. Miles 1 through 21 with 20 year old Cavin Miller, living in Southern California going to school, but originally from Cool, CA, or another similar town, that I forget the name of, that borders the Western States 100 mile course. We’d met and ran together on a training run 5-6 weeks before, with Cavin just carrying one water bottle the 26 miles from Bluejay to Santiago Peak and back (there was a water drop that he would use at miles 5 and 21), and me planning on running 40 that day, carrying a full, 3 liter Camelback, two 22 oz. hand helds, and two more full in the back of my Camelback. Miles 9 through 34, with Brandon Adame, who’d beaten me by 34 minutes in August’s Mt. Disappointment race, and in other races this year as well, and who I had hopes of finishing ahead of in this race as a good measure of my improvement. By race time, due to the impending weather, I had decided I didn’t care if I placed ahead of or behind Brandon, or anyone for that matter. I wanted to run a good race and hoped that I, and all runners, reached the finish line safely. When Brandon caught up with me at mile 9 (he’d passed me at mile 3-4, but was one of several runners who took a wrong turn at a confusing junction on the 9 mile loop at the beginning of the race) we had the greatest time, just marveling at the weather, and talking about our racing in the past year, and talking about what was upcoming on the course in this particular race. By mile 23, it seemed to me that Brandon would again be stronger than me on this day. At each downhill he pulled away 100-300 yards, only for me to catch up again on the next uphill, because he was removing a small rock from his shoe or taking a “restroom” stop, or he just was taking it easy and running conservatively early in the race. By mile 34, just before we got to the turnoff for the 3.2 mile, rocky, single track to Silverado Canyon (mile 38.2), Brandon had pulled ahead of me,. probably for good, because my quads were already starting to not feel so good. Brandon called me the next morning to ask how I was feeling. He said he was going to go on a 10 mile run. I told him the only places I was walking to on Sunday would be my couch to maybe catch part of a football game with my four and a half year old son, Benji, or to my backyard, to secure a flowering pear tree I had recently planted that had almost been ripped away by the wind from the latest storm. I live two hours north of the Chimera. Miles 14 through 38.2 with Adalberto “Flaco” Mendoza, who had given his time all late spring and summer, running, and sharing his advice, with me and my friend Jose Hernandez, on all sections of the AC100 course. Jose, Anibal Corsi, Carlos (Flaco’s usual pacer, and close friend, for 100 mile races), and I, had special, long sleeved shirts made for us to wear during the 2009 AC100 that read “Team Flaco Mendoza”, out of respect for Flaco and all of the time he had given to us during the year, and also because the AC100 RDs had unceremoniously, but legally, sent back his check, which was truly in the mail on the very day that the AC RDs had closed the race on June 1st and allowed no further entry. Even when Ben Hian and others dropped out of the AC100 for various reasons, the AC RDs would not let Flaco (a previous 2nd place finisher at AC, and I think even a 2nd place finisher one year at Badwater) into the race. That is when we decided to make and wear the shirts. We would have Flaco in the AC100; we would be running for him! 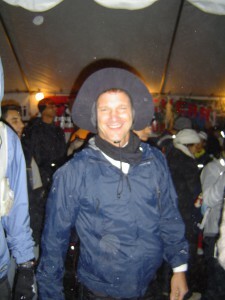 The 2009 AC100, as you know, was eventually cancelled, so I would be wearing my “Team Flaco Mendoza” shirt over an Underarmour “coldgear” one, and under a rainproof shell for the Chimera 100 mile. Before the race, Jose told me that Flaco had injured his foot on a night run two weeks before, but if that was the case, it sure didn’t seem like it in this race. Flaco caught up with Brandon and me at the Trabuco Trailhead aid station, (about mile 14?) wearing only shorts, shoes and a long sleeve shirt, under a very wet and whirling Hefty trash bag. “No, no, mi amigo. Solamente tengo este.” (I only have this, he said, looking down at his less than reliable Hefty bag poncho). From mile 14 through 34, Flaco shadowed Brandon and me, never farther than 100 or so yards behind. Each time Brandon and I would quicken our pace for a stretch, and look back, expecting to have dropped the 58 year old Flaco Mendoza behind, there he was, with his Hefty bag poncho, whirling above his waist, in the wind, cold and wet, undefeatable, tireless, like the great ultra runner that he is, injured or not. My greatest honor was to be running down what would be the last 3.2 miles of this race, down the Silverado trial, with Flaco, only 40-50 yards behind. As my quads felt a little “less than happy” going down this trail, and I thought that Flaco surely could pass me if he wanted to, the thought did cross my mind that maybe Flaco was just staying behind me to make sure I was OK. He had run many 100s before, but this was my first one. “Bien hecho (good job! ), Flaco. Bien hecho!” I told him. “Bien hecho a usted, tambien, Roberto. Bien hecho, Muchisimas gracias! When we got to the Silverado aid station I was ready to tell my great crew, Cheryl, that it was no question, I would be changing into a new pair of socks and another pair of shoes. Please get the foot powder out. Even if my feet can only be dry for an hour or so while running from Silverado back to Maple Springs at mile 45.4, I’ll take it. I’m changing my shoes and socks at mile 62 as well. “But where is the chair?” I asked Cheryl. Forty-eight hours after the race, my two and a half year old daughter, Shana, still beats me in a footrace from the fireplace in our living room to where our kitchen begins. We held a second heat and, in what gives new meaning to the nefarious term “two time loser” Shana beats me again. “But I still have a faster first step!” I brag to my wife. She shouts back that it’s because I was the one who said “ready, set, go” and I left out the “set” part, but please, please, believe me, that’s not true. Well…it kind of is. I awaken this morning at 3AM (still on race day schedule I guess). I walk down, and up, the stairs without much of the soreness that accompanies those trips in the previous 2 days. I eat my standard Cool Mint Chocolate Clif Bar, a banana with a glass of water, and those “Juice Plus” pills my wife had me start taking late last year. I have grand hopes of not getting “chicked” again today, and being able to beat my two and a half year old daughter in a race…at least…to the front door. Aren’t you technically a three-time loser since you also missed out on the WS lottery? I know it sucked for the runners, but I feel for the organizers. I have wondered what we would do at Waldo if it was snowing or otherwise dangerous on the summits. We did have lightening two years ago that almost had us pull the Maiden Peak summit monitor. But, really, rain and a little wind? This doesn’t help the reputation Californians have up here in the PNW (except for White Trash who says he’s actually going to run in the rain this year). I recall that Miwok was almost canceled a few years ago because of mud. That rain is horrible stuff. You get wet! Burly!!! Too bad they had to shut you guys down. Sounds like it was the appropriate call. Hundreds are hard enough in comfortable weather. 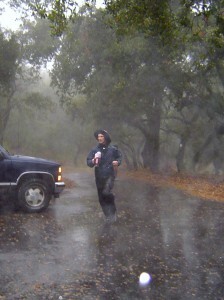 Maybe you should try Badwater … at least that rain is warm! Wow! That sounds incredible. Think it’s time for you to pick something that’s guaranteed to actually happen. You know, something like Javelina. That is one amazing story. Thanks for sharing! Thanks for pointing that out, about me actually being a three time loser. 🙂 Do I get a belt buckle for that? Aren’t you glad, though, that I wasn’t somehow chosen for the 2010 WS100? After fire for AC and rain/cold/mud/etc. for Chimera, what would I have brought upon WS? Flash floods? God forbid, an earthquake? Take your pick of remaining natural disasters. I’m thinking of staying away entirely from the WS100, for fear of cursing that race as well! But I have a strong desire to volunteer there, or pace if there is an opportunity. I just want to say that every 50K, 50 miler and 100K that I have entered have not suffered such cancellations, so if/when I sign up for Where’s Waldo in 2010, or a subsequent year, there SHOULD be nothing to trouble yourself about. Re: the rain, all I can say is that I, and all the runners I saw at the Silverado aid station, had no thoughts of stopping. There was genuine disappointment. The California runners were tough. The Forest Service, on the other hand, apparently had runner safety in mind. Badwater is one race I do not have any desire to do. I like the idea of aid stations in a race. Am more attracted to the traditional mountain 100s. Right now, the longest races for next year that I am thinking of doing are a repeat of the beautiful Bishop 100K in May, and the Where’s Waldo 100K in August (not sure if I want to run in the lunar landscape that will be the 2010 AC100, even if they DO pull off staging it in 2010). I will have to think about what poor 100 mile race I will subject my entry to in 2010 or 2011. @Robert Blair, Seriously, running a 100 miles in 9 inches of rain does not sound fun. Thanks for sharing your experience and we’d love to see you at Waldo. Nice post Robert, and sorry you were foiled again. I’m thinking summer and east coast for your next 100-mile attempt! Thanks, Craig. Am hoping to be there. Thanks, Nick. Will definitely stick to picking another one in summer, and hope there isn’t a fire that affects it. I was there. My dad ran while i voulenteered at the trabuko trailhead aid station. It was freezing even there and the aid stations we’re prepared very well. Out hear kpet going out. Our tent was leaking in. And there was a stream straight through out tent. ultimately, our mnm’s turned to Mnm soup, our saltine crakers were too soggy to even lift out of the tray, and even the soda was flatrend by the rain.